Are you looking for a dual-function EDR InfiniBand and/or 100GbE adapter for your HPE ProLiant XL and DL Server families? The HPE InfiniBand EDR/EN 1-Port Adapter is designed for customers who deploy high performance computing (HPC) systems with their HPE ProLiant XL and DL Server families in the data center. Based on Mellanox ConnectX-4 technology for scalability and fabric flexibility, the single ported card can function as a single port EDR InfiniBand card, or a single port 100GbE card. Combined with EDR InfiniBand Switches or 100GbE Switches, they deliver low latency and up to 100 Gbps bandwidth, ideal for performance driven server and storage clustering applications in HPC and enterprise data centers. The 841QSFP28 adapters are based on Mellanox® ConnectX-5 technology. 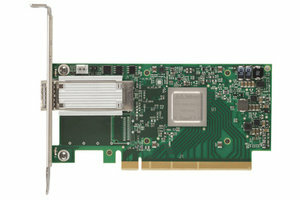 The 840QSFP28 adapters are based on Mellanox ConnectX-4 technology. The HPE InfiniBand EDR and 100 Gb Ethernet adapters are supported on the HPE ProLiant XL and HPE ProLiant DL Gen9 and Gen10 servers. They deliver up to 100Gbps bandwidth and a sub-microsecond low latency for demanding high performance computing (HPC) workloads. The adapter includes multiple offload engines that speed communications by delivering a low CPU overhead for increasing throughput. HPE InfiniBand EDR/Ethernet 100Gb 1-port and 2-port 841QSFP28 Adapters support MPI tag matching and rendezvous offloads, along with adaptive routing on reliable transport.